I'm not sure what it is with me and things being JUMBO.... but I just think they are much cooler. This was a previous idea from Love Actually that Melanie from Sugar Doodle used, adapted and shared with her readers. I love it! There was an idea on "Love Actually" for making personalized crossword puzzles. I loved the idea!!! With my hubby's birthday quickly approaching, I knew it would be a fun thing to do. I came up with many questions myself but I also invited other family members to contribute questions. It was fun to see what they came up with! 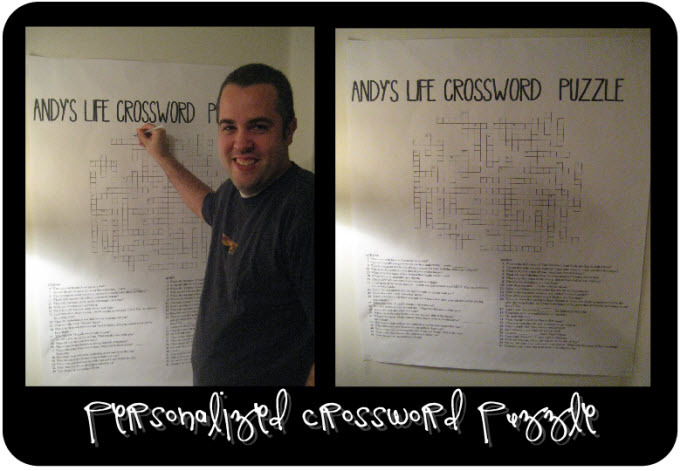 There are several free crossword programs online but I used one of the two mentioned on "Love Actually". Click here for the one I used. Hello? How cool is she? Thanks for the inspiration, Melanie! What a nice blog . i really like it. What an amazing idea!! How cute!! Ugh! I SO LOVE THIS! My hubby just had his 30th birthday last September, this would have been a FABULOUS idea. Well, guess I'll reserve it for our one year wedding anniversary. See if he remembers all the cool things we did during our first official year as a wedded couple!